Ever wonder what Shaun T's, creator of Insanity, fridge looks like? Abs are made in the kitchen, or at least that's what everyone keeps telling me. I used to workout so I could eat whatever I wanted, but this method can only take you so far with fitness and once you get to a certain age, it doesn't work as well either. Shaun T stresses that water intake is vital! You need to be drinking at least 8 glasses of water each day. Some experts say you should drink half your body weight in ounces. He also recommends eating lots of bell peppers and oranges to help with free radicals, cucumbers, and sweet potatoes. This is me after I completed my first round of Insanity. 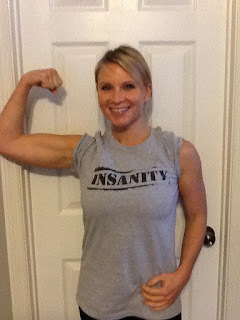 I loved it so much, I became a Beachbody Coach. Message me to learn more about how Challenge groups can change your life like they changed mine! Thanks to Dr OZ for the info!